Hello, friends!!! Between the busyness of this season and the wonder of celebrating Christ’s birth this Christmas, my posts will continue to be sporadic. 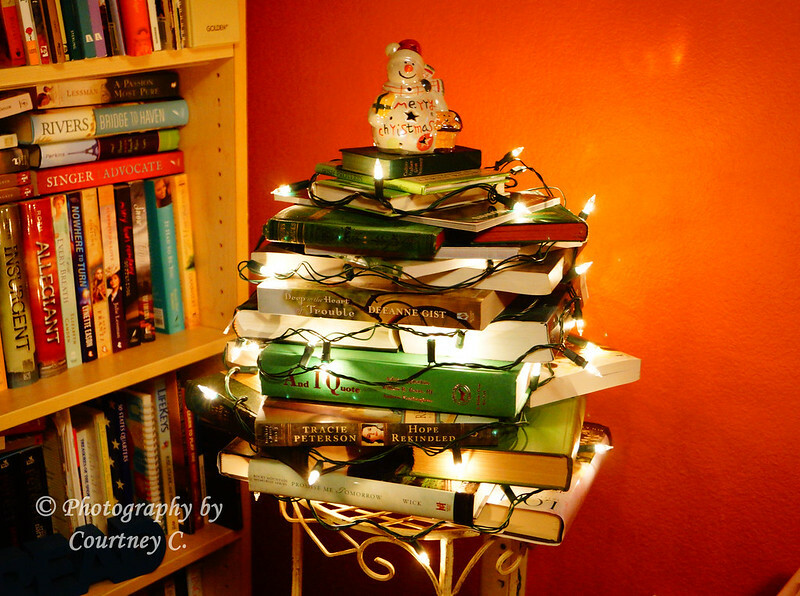 With that said, I want to share my recent bookish project: a book Christmas tree!!! It makes my bookshelves all festive. This was super easy to make. All you need is a small space to stack, a variety of sizes of books (They don’t even have to be green! ), and a small-ish string of lights! I used a small table as a base, but I’ve seen some on Pinterest using cake stands. Just begin by arranging larger, sturdy books at the bottom (started with 4 hardbacks), then add slightly smaller groups of 3-4 as it grows. Have you ever made a tree using books? Or any other book “sculptures”? Please share your craftiness in the comments! I’ve love to know! 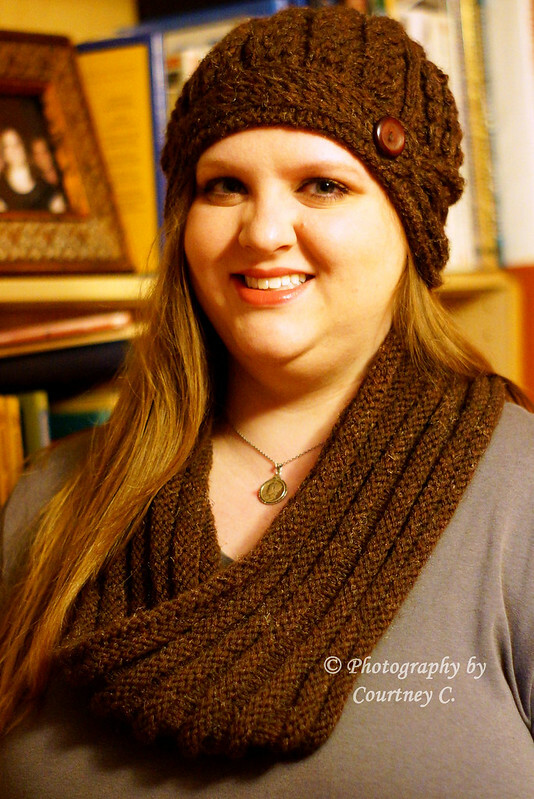 I’m finally ready to share two of my latest knitting projects, a knitted “Helmet Hat” from a Vogue Knitting pattern and a knitted “Backseat Passenger Cowl” from a free Amy Castillo pattern on Ravelry. 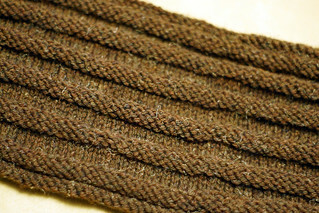 I used size 8 circular knitting needles and 1 skein of Lion Brand Wool-Ease in Mink Brown. I followed the pattern as written, but modified the side pieces slightly. As the pattern was written, I thought they would be too tall and floppy. After the textured rib pattern repeat, work row 1 again. Next row: K1, p2 *ssk, p2* repeat from * to *, end with k1. 25 stitches total. Next row: P1, k2tog, *p1, k2tog* repeat from * to *, end with p1. 17 stitches total. Bind off. 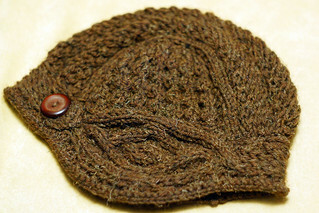 I used size 8 circular needles and 2 skeins of Lion Bran Wool-Ease in Mink Brown. I followed the pattern as written except for 2 minor things: I casted on 144 stitches instead of 157 and I added 1 additional knit & purl round repeat. I love how this pattern is reversible! 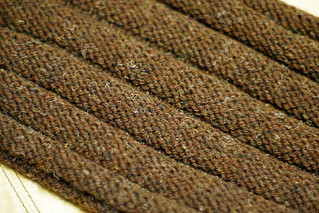 Each side has a different look due to the number of purl stitches. One is a bit chunkier. 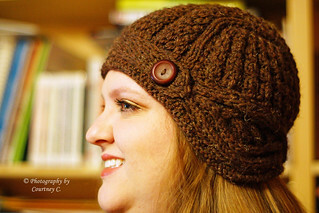 Visit my Ravelry projects page to see these and more of my projects! A look back at 2013 and looking forward to 2014 (to the empty shelf challenge). Looking back at 2013 here at The Green Mockingbird, I’ve done a little bit of everything. Several crafting projects, including finishing a quilt; conducting a solar-dyed yarn project & making a hat from the same yarn; and adapting a scarf pattern to crochet a table runner. I’ve shared some photography news and a few photos from this year. In the cooking department, I’ve made my own birthday cake, shared a strawberry pina coloda granita recipe, and an easy iced chai tea recipe. Most prominently, in 2013 I began featuring book reviews, book-related posts, and occasional “Fun Find Friday” posts covering several topics. 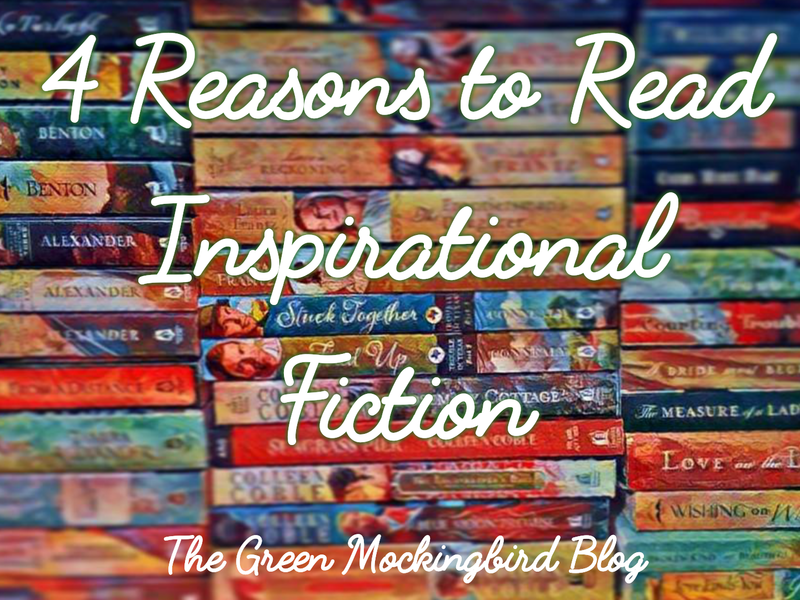 Looking back at the books I’ve read in 2013, I have to share my favorites. 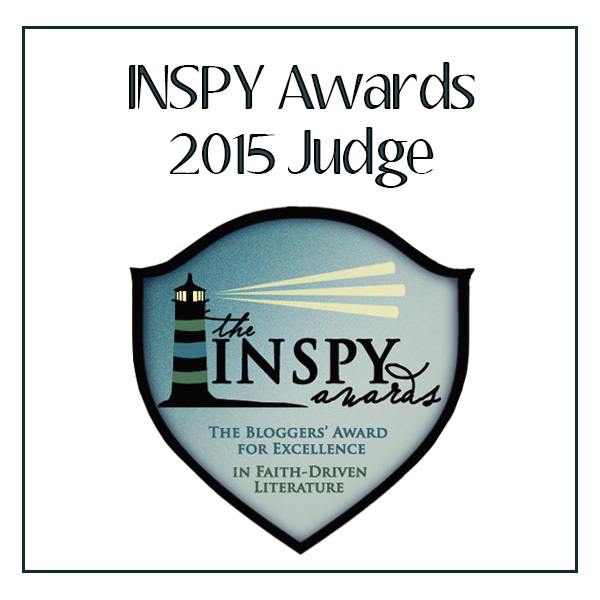 They include (in no particular order) the entire “Winds of Change” series by Julie Lessman, “Fired Up” by Mary Connealy, “The Breath of Dawn” by Kristen Heitzmann, “Fifteen Minutes” by Karen Kingsbury, and “Dear Mr. Knightley” by Katherine Reay. 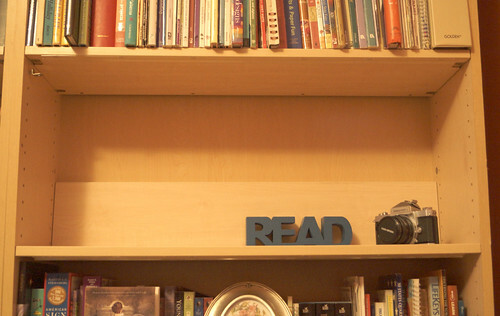 Have you heard about the Empty Shelf Challenge for readers in 2014? It’s a challenge to start with an empty bookshelf and fill it as you read in 2014. Supposedly, I should be more motivated to read and fill it if it is a visibly empty shelf. I had to rearrange a little – ok, a lot – to empty a shelf to start fresh in 2014. I’ll be keeping track and sharing my progress on my Pinterest board. Find out more info and read the original post here. I read a total of 33 books in 2013, not counting what I’m currently reading. My goal for 2014 is at least 40 books. Empty Shelf Challenge 2014, a photo by courtneyec90 on Flickr. If you participate, use the hashtag #EmptyShelf in social media. As we look ahead to a fresh year, I’d like to wish you a Happy New Year! May God bless you abundantly in the coming year. It’s the Antique Pattern Library compiled by New Media Arts, Inc. The booklets on this website contain antique patterns, some published as early as the 1800s, with links to download the complete booklet in .pdf form (for free)! I have loved looking through some of these pattern books. I think it’s fascinating to see the old styles and fashions, as well as the cover artwork. 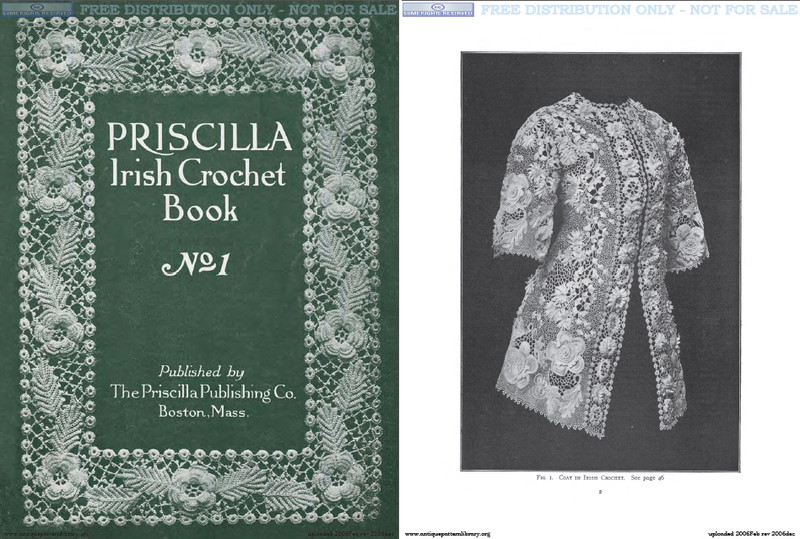 How awesome is this Irish crochet coat from this booklet? Can you imagine wearing it as “everyday” clothing? 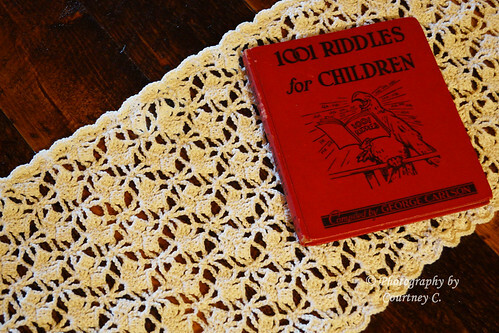 I hope you enjoy this trove of patterns – they will certainly keep you busy! I love fall. It’s one of my favorite seasons! (I really do love them all, but I’m not a fan of the hoooot summer days). With pumpkin EVERYTHING, what’s not to love? My favorite pumpkin food would be a pumpkin pie, made with a fresh pie pumpkin, and real whipped cream. A truly unique pumpkin food I tried recently was pumpkin ravioli with browned butter and sage. Yum! 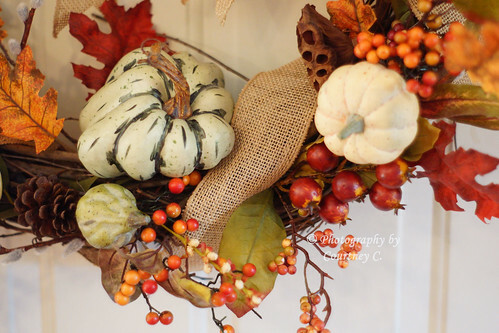 I was inspired by all the fall decor I had seen in different stores recently. And on Pinterest. 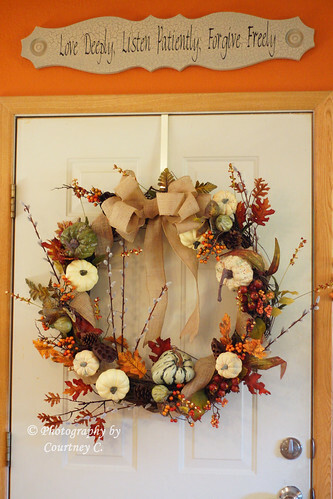 I decided to make a wreath from various picks, pumpkins, and gourds I gathered from my favorite craft stores. Here’s the burlap bow I made! It was simple and easy. 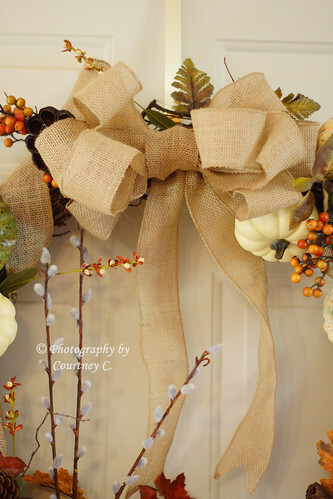 I used wire-edged burlap ribbon. And, a close up of my favorite gourd. 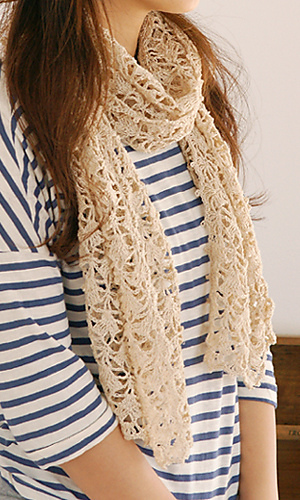 I had big plans to crochet a lacy scarf I found on Ravelry. As it grew, I decided it would be better if it were a table runner. It was a little too wide to be a scarf, partly due to the yarn I chose. 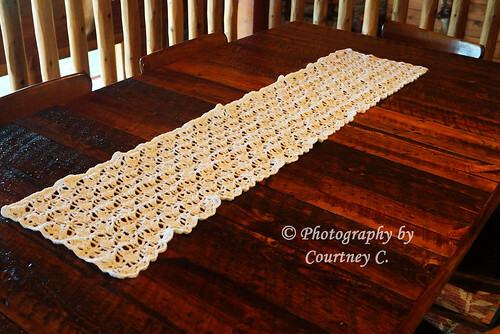 So, what began as a frilly scarf became a perfectly sized ivory table runner. For the foundation chain, chain 79 instead of 112. The pattern will repeat as written over those stitches. 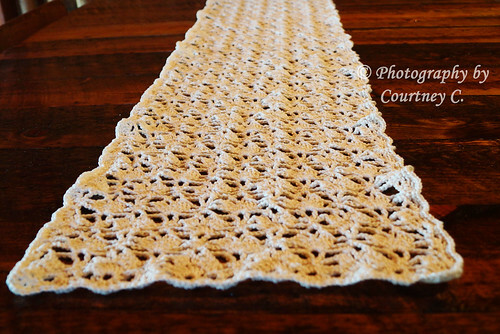 Repeat the pattern until piece measures close to 51 inches in length, not stretched. 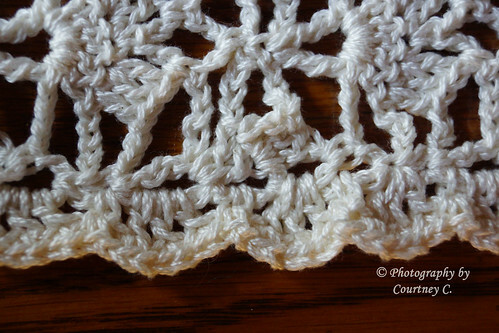 On the last round of the edging, I didn’t follow the pattern as written. Instead, I worked a sc in each of the dc’s and the sc’s of the previous row. And, I chained above all of the chains of the previous row. So, the last row of the runner went something like this: *sc, ch, sc, ch* repeat. Have you ever changed your plans for a project part of the way through? 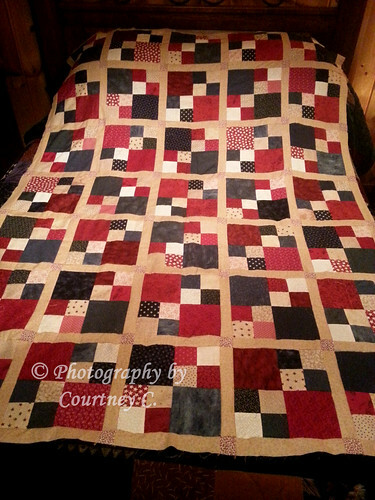 Americana Four-Patch Quilt: Top Finished! I wanted to share this photo of a quilt top I just finished. I designed this twin-size pattern and sewed it with my mom’s scraps from another quilt. It has taken me several months to complete, mostly because I have not worked on it since last fall. Last night, I decided to get it out – and I finished it in about 2 more hours. The top is now done, and it’s ready to send to the quilter’s! I really like the Americana-style color combination. It will make a nice throw for me – plus I’ll use it to “decorate” my bed for July 4th!